Each baby is on his or her individual schedule. 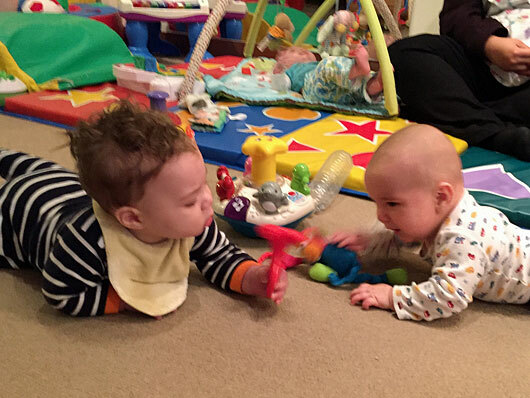 Feeding, changing, napping and lots of play-time and loving interaction. “Lap time” provides comfort and affection. Group play and activities support cooperative behavior with positive reinforcement – lots of smiles, hugs and praise. Weather permitting; we enjoy walks in the park in our four-seat strollers. Babies love the fresh air, the motion and sights and sounds of the outdoors. Independent skills are encouraged at feeding time as they learn to feed themselves with finger foods and to use cups, bowls and spoons. It is messy but rewarding! We respect your very special relationship with your baby and will try to provide a routine similar to what your child experiences at home. We follow your lead in introducing new foods or activities. 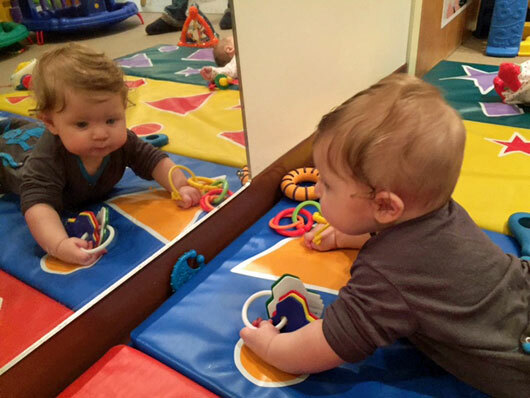 The infant room offers a no-street shoe play area for crawling and exploring. The church provides several private breastfeeding spaces for moms and babies.